Requirements: 1kg baking soda, 1kg corn starch, 1kg citric acid, 10ml raspberry fragrance, 10ml raspberry fragrance, Pink powder dye, 6 x 450m Jars, Bath Fizz stickers METHOD: Mix your cornstarch, citric acide and baking soda together in a bowl. Add 5mls of each fragrance and a pinch or two of pink powder dye. Now mix this all through well. Place in jars and seal well. 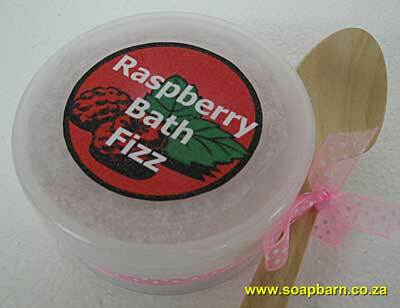 Sprinkle raspberry bath fizz into your bath for a wonderful, colourful, fragrant fizzing bath. Just like fizz balls but a whole lot better!